Hi Sharon. I like the subtle light at the horizon. What was time of the day you took the photo? Hi Eric! Thank you. Yeah, about the light, the time of day was shortly after 6PM - about two hours before sunset. The sky had been a paled out summer blue - not cloudy - right before this. It was startling. I had been walking along the shore, not paying a lot of attention to the sky for about 10 minutes, but I noticed the light had changed considerably. I turned to face the horizon and actually gasped. A thunder storm was coming in, fast. The colors at that moment were amazing. This is actually my favourite time of day around the bay where I live.. the light changes rapidly just before sunset and one sees all those gorgeous changes in colour.. sea and sky.. thanks for sharing your world with us..
Well I'll be sharing more of the world soon.. just a few more sleeps to go... excited and nervous... sorry for my absence.. too much to plan/organize..
Hi Julie, And thank you too, for sharing your world! I have seen your gorgeous photos. 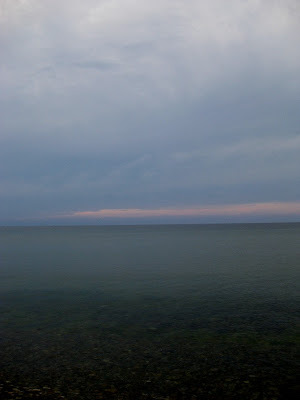 Well, all your photos are amazing, but I'm talking now of sea and sky - and moon ones. Hi Amy, hope your time out was delightful. Thank you. Yes, the colors were truly amazing and you are right, it was a hot, hazy day - but not overcast - until a couple of minutes before the storm swept in, at a really fast pace. Such a wonder-filled moment, to look up and see this!